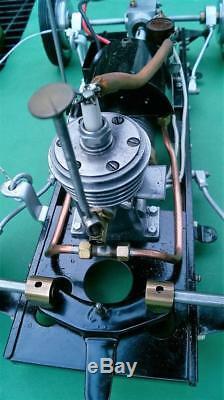 ME Models 1948'Special' Tether Car Stentor 6cc 2 stroke engine. 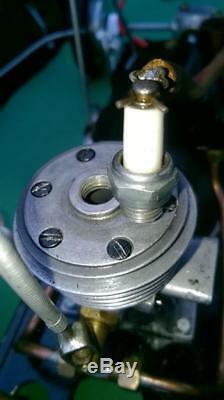 Engine has good compression and when the spark plug is grounded and a 6volt battery connected , sparks are produced, however the solder on the connector is loose and it needs a better quality joint. The tyres , although looking good, have fine cracks and are probable too brittle to use. The chassis is stamped 1474 and is one of about 1750 models of various types produced, perhaps 1 of 25'Specials' left in existence. Everything appears to turn freely. The strap over the bonnet really needs a better fixing so that it pops onto the chassis mounted popper stud and mounting poit atthe other end. I think the electric component are probably good apart from soldered connections, which although they might look good I'm sure are brittle with age. The original body shell, carved from wood has the number 40 stamped into it to denote the actual individual who made it. Looks to have been very little used and to have been tidied up to a very high quality at some stage. The cap on the fuel tank is missing. Incredibly impressive as a display piece with great history. 18 inches long, 8 inches wide. 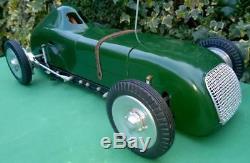 1948 ME Models 2 stroke 6 cc Tether Car chassis No, 1474 body No. 40 1 of 25 left. 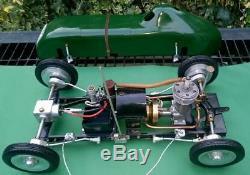 ME Models 1948'Special' Tether Car original Stentor 6cc 2 stroke engine. Complete with original Bowden Cable bridle and brackets. The chassis is stamped 1474 and is one of about 750 models of various types produced (numbers started at 1000), perhaps 1 of 25'Specials' left in existence. The strap over the bonnet really needs a better fixing so that it pops onto the chassis mounted popper stud and mounting point at the other end. I think the electric components are probably good apart from soldered connections, which although they might look good I'm sure are brittle with age. It isn't in a condition to be used without attention to solder, tyres and the lack of a suitable battery, so I can't in anyway guarantee its kinetic qualities, but its history and appearance are there in abundance. Auctiva offers Free Image Hosting and Editing. 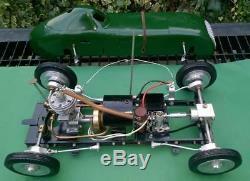 The item "1948 ME Models 2 stroke 6 cc Tether Car chassis No, 1474 body No. 40 1 of 25 left" is in sale since Wednesday, February 07, 2018. This item is in the category "Toys & Games\Radio Control & RC Toys\Tether Cars".